You've got to love this mother who brought her daughter's condition to Jesus' attention and the man's friends who took the initiative to bring their hearing- and speech-impaired friend to Jesus. In the Bible, many people brought individuals to Jesus. At the beginning of His ministry, Matthew records: "… they brought to Him all sick people who were afflicted with various diseases and torments, and those who were demon-possessed, epileptics, and paralytics; and He healed them" - Matthew 4:23. Another time "… they brought to Him a man, mute and demon-possessed…" Matthew 9:32. A father brought his demon-possessed son to Jesus - Mark 9:17-20. "… men brought on a bed a man who was paralyzed…" and from the housetop broke through the roof to lower him before Jesus - Luke 5:18-20. Annoyed bystanders brought the loud blind man to Jesus when Jesus "… stood still and commanded him be brought to Him" - Luke 18:35-42. Andrew brought his brother Peter to Jesus because " 'We have found the Messiah' …" - John 1:40-42. Philip invited his skeptical friend Nathaniel to meet Jesus - John 1:45-46. Philip and Andrew were a go-between for some Greek seekers who wished to see Jesus - John 12:20-22. The scribes and Pharisees brought a sinful woman to Jesus as a test - John 8:2-6. 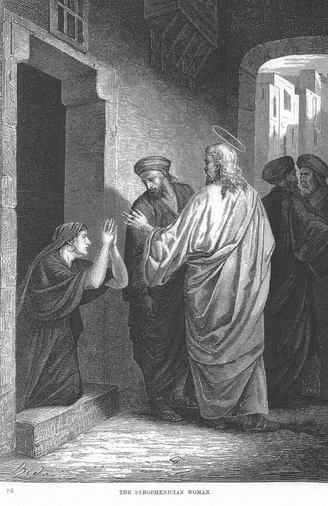 Martha invited her mourning sister Mary to come to Jesus - John 11:28. 1. Often people aren't named, just referred to as "they." Neither is much said about the person they bring. The spotlight is on Jesus. Perhaps we can conclude from this that our bringing others to Jesus is not about us at all or even about them but on God and how He is glorified through these encounters. 2. People brought others to Jesus as a solution to a variety of problems including physical, mental and emotional. We too can take any problems our friends or acquaintances have, to Jesus. 3. Even when the reason behind bringing someone to Jesus was less than pure, there was a good outcome (Luke 18:35-42; John 8:2-6). Mixed motives on our part shouldn't hold us back from bringing people and situations to Him. We still bring people to Jesus—not bodily but in our prayers. Let's continue to do this, asking for His healing of the sick, His touch on physical deficiencies, His breaking of bondages for the demon oppressed, His forgiveness of sin, and His illumination as to who He is—all for God's glory. PRAYER: Dear Jesus, help me to realize I need to bring the needs I encounter to You in prayer as a first action, before I give any advice or embark on any action. Amen.